9/10… Are You Stealing a Canoe? I woke early, aware that the only part of my body that was exposed beyond my sleeping bag, the tiny circle around my nose and cheeks, was numb with cold. The rangers were right, it was a cold night, but the focused preparations (a big dinner, multiple layers of pajamas, a mouthful of whiskey for mom and dad, and an early bedtime for all) saw that we met the challenge. I wasn’t going to get back to sleep any time soon, so pulled on all the clothes I could find and ventured outside to boil some water, brush my teeth, and sit down to do a little writing. By the time the girls were up and moving around, dawn had broken and we were presented with a clear blue sky, and further, it was warming by the minute. Val and I had three outings planned for the course of the day all along the interior road of the park, and so once we had everyone fed we piled into the truck to head off. En route to our first destination, Val took a call from her younger sister that had us pare back our itinerary. The contents of their father’s house had been shipped to Minneapolis, and the three sisters (without Val, obviously) had been going through literally two hundred old boxes to try to filter through this lifetime of accumulation. This process had been exacting a severe emotional toll on all the girls, and after Val hung up the phone she was visibly shaken and I made the executive decision to simply journey to Lac Edouard, which appeared to offer a short hike, a picnic area, a beach, and even canoe rentals. This way, I reasoned, regardless of what Val felt like doing, I had just about all our bases covered in one spot. 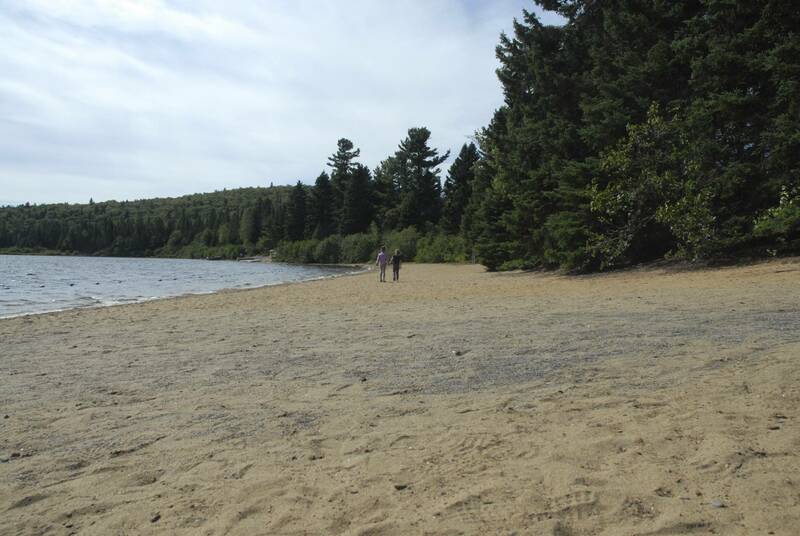 As we pulled into a wooded parking lot it was difficult to get a sense of the location, but a short trail led into a picnic area and then onto a beach, a sandy horseshoe at the tip of a huge lake that spread out like a crooked finger directly ahead of us. The sun beat down, warming us to the point that I had to strip off the by now comical number of multiple layers I had on, my memory of the prior night’s cold having misinformed my clothing choices. The girls bolted for the beach while we enjoyed a lazy lunch on a picnic table. 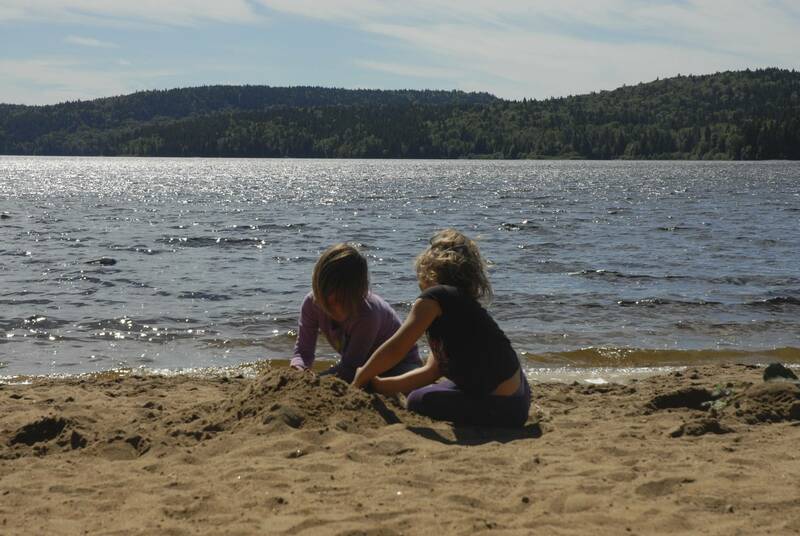 We then dragged a couple of chairs out to the water’s edge and spent the next two hours reading to each other while the ladies constructed an entire city in the sand before us (restaurants, washrooms, a school, a secret cave, etc.). Reading out loud to each other began as the only visible solution to a problem, namely, that like a jerk I had started to read the very book she was reading, and had more or less caught up to her, and that whenever there was an opportunity to read we both wanted to read that particular book. So, we decided that she would read a chapter of it to me one day, which worked and was oddly enjoyable and intimate and yet felt quite archaic, only archaic in advance, like we were preparing for the day when I would be old and senile and blind and she would be at my bedside reading books to me. And Leonie and Sylvie and their kids would make fun of us, because there was technology that would allow your watch to read you a book any time you felt like it, so why does the old man keep demanding that his wife do it? Regardless, I lay out, shirtless on the sand, and let my mind wander, and enjoyed the book as spoken by Val, and after a few chapters, took over and read to her. After a couple of hours of complete lethargy, Val and I tried to bait the girls with the specter of a walk in the woods. No way, they were having too much fun on the beach. 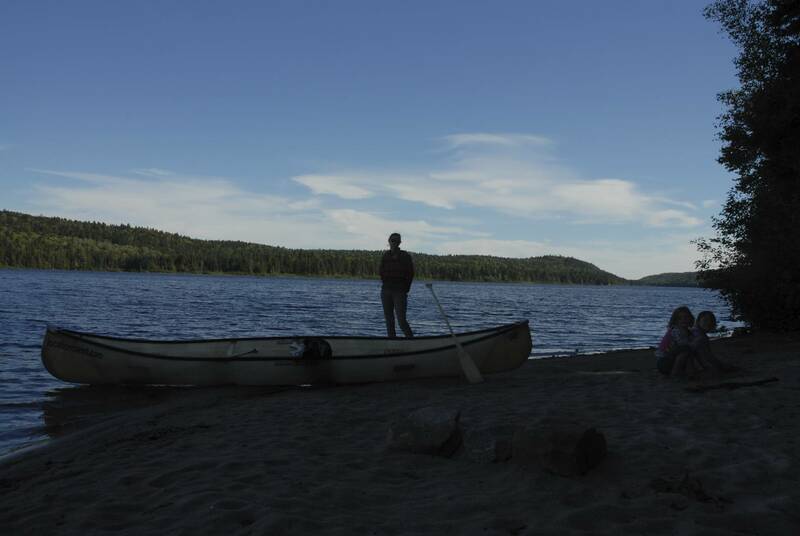 All right then, we countered, what if we walked down the beach to the canoe rental place and got a canoe? This spoke to them. They took off, running to the opposite end of the beach while I gathered our things and got my wallet and their two small life preservers from the truck. When we got to the rental building, while there were dozens of canoes and kayaks and even a couple of paddle boards laying about, there wasn’t a soul in sight there to take our money. We surveyed the situation. Someone had recently returned a set of paddles to the nobody working at the counter, and so two paddles and two adult lifejackets were simply waiting for us. Staring at us. Begging to be used. We grabbed the gear and headed down to the beach. “Dad, are you stealing a canoe?” asked Leonie. We took a lazy tour of the lower part of the lake, stopping at beaches the girls directed us to, and watching an enormous heron make its way through the reeds toward a potential meal. We told the girls stories about how we went canoe camping when Leonie was just 16 months old and Sylvie was hiding in Mom’s tummy, and they loved it. The girls, of late, have been exceptionally interested in the stories we tell about their origin. They will ask, time and again, to hear the story about how Leonie was born or how Sylvie was born, and they have this canon committed to memory so that if we leave out any of the crucial details (“Dad – you forgot the part where you park the truck at the hospital!”) we are chastised, corrected, and then ordered to continue. It has been a while since Val and I have been on the water together and we were clumsy, frankly, but the water was calm with only a slight wind, and the sun was high, and it was a warm day and it was really impossible to feel like we’d get into too much trouble. We lazed about on the water and after an hour or so headed back into the rental area, placed the paddles and life vests back where we found them, and tiptoed back to the sand city the girls had erected earlier and resumed reading to one another. And then we stopped reading and just looked at the kids, and looked at the empty lake, and all the trees and the sun and the greens and pushed our bare feet into the warm sand and felt really luck, really happy. Content. As the sun began to set we herded the girls into the truck, stuffed them into a change of pants and, knowing that they’d be hungry, plied them with cheese. We drove back to camp and made, by request, mac and cheese (an improvisation with some bowtie pasta from our dry goods box and some mozzarella we had lurking in the fridge) and pan seared broccoli, both of which went over huge. Val and I prepared a sauté of onions and zucchini and the yellow and green beans we had picked up at the farmstand outside Chicoutimi, and poured it along with the remains of a jar of pesto over the balance of the pasta, and it was terrific. A miracle occurred, as while we had thought we were out of wine, in the process of organizing the truck for tomorrow’s long day of travel out of Quebec and into Ontario, we discovered a bottle of capable Malbec. Down it went, and we were all feeling quite well. We did the dishes and I started a fire, and Val set off to the truck to retrieve a sweater when she noticed my phone ringing – remarkable because we virtually never keep an eye on our phones, we virtually never get service out here, and I don’t even have my ringer on so she would have only really noticed an incoming call at night, the phone blinking at her from the dashboard of the truck. It was our attorney in Arizona, calling with an update about the resolution of Val’s father’s estate. I spoke with her for a few minutes and, as there had been an offer on his house, then called all the sisters to update them. In turn, Val had a chance to speak with her sisters over the course of the next hour and, as she hung up the phone on the final call, the weight of the day and her father’s passing came crashing down on her in full force, and she curled into her chair in front of the fire with her face buried in her hands and I could only look on from a distance. Our girls had completely lost themselves in another of their games, building houses for their stuffed wolf cubs and arranging marriages amongst them, so I fed the fire and let it warm the two of us and, after a half an hour or and hour even, we spoke a little and I sent her off to bed. I put the last of the wood on the fire and the girls emerged from their game to join me, exhausted, and we watched the fire together, talking and not talking, a father and his daughters. I found myself hoping that I would be a good enough person to these kids of mine, a good enough father, that my inevitable passing will move them in no small way too. That they’ll pry open a box of letters, or pictures, or read a story I wrote, some day decades from now, and call each other, and fall warmly upon my memory. If that’s all I get from this life of mine, I’ll call it a success. ← 9/09… Feel any Longing?